Mild heart attack symptoms can mimic those of a more serious heart attack. Here's how to tell the difference—and the type of help required. Mild or more serious, heart attacks produce symptoms that should be taken seriously: chest pain, shortness of breath, nausea, pain or tingling in one or both arms, or jaw, neck, or back pain. The short answer is “yes.” And the extent of damage to the heart muscle itself determines whether a heart attack is major or minor. Keep in mind, however, that mild heart attack symptoms can resemble those of a more serious heart attack. That’s because heart attack causes refer to the blockage in one or more coronary arteries, no matter what kind of lasting consequences they leave behind. But whether they’re mild, major, or somewhere in between, heart attack symptoms should be treated with emergency care. Does 140/90 still serve as the threshold for high blood pressure? New hypertension guidelines issued by the American College of Cardiology (ACC) and American Heart Association (AHA) call for a lower reading. Click here for our report. By definition, a heart attack is the result of blockage in an artery that supplies blood to the heart muscle. These blood vessels are called coronary arteries. You’ve probably heard the term “coronary artery disease,” or CAD. That just means that there’s plaque buildup in one or more of the heart’s arteries, and that it’s reducing or blocking blood flow in those arteries. The plaque is a waxy substance that includes LDL cholesterol, fats, and other waste products from your bloodstream. 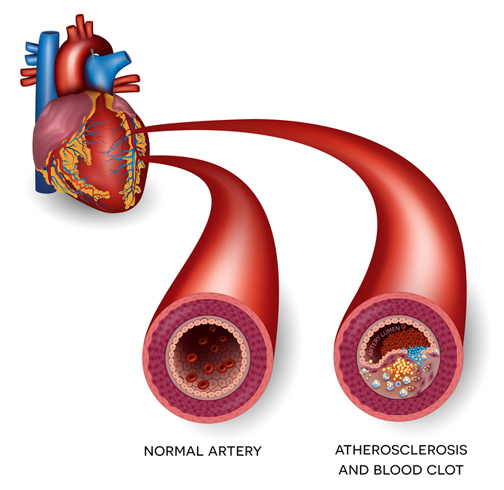 The process of plaque building up in your arteries is called atherosclerosis. You may know it by a more familiar name: “hardening of the arteries.” This buildup takes place over many years. There are some less-common heart attack causes, too. One of your coronary arteries could spasm and shut off blood flow to the heart muscle. Sometimes smoking or illicit drugs can result in coronary artery spasm. A spasm can occur in a coronary artery that isn’t affected by atherosclerosis. Also unusual, but still possible, is a tear in the inner wall of a coronary artery; this is called a spontaneous coronary artery dissection. An artery has three walls or layers. When blood seeps through a tear in the inner layer, it can become trapped and bulge inward. 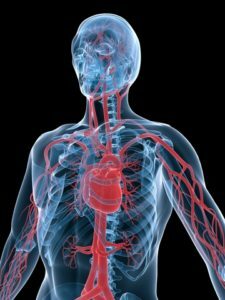 As a result, blood flow through that artery becomes blocked. Chest pain, in many cases pain that comes and goes. It may be centered in the chest or spread from one side to the other. Pain or tingling in one or both arms. Don’t be lulled into a false sense of security if the pain is only in your right arm. Arm discomfort due to a heart attack isn’t limited to the left side. Jaw pain, neck pain, or back pain. Breaking into a cold sweat. Feeling unusually tired, sometimes for days. Symptoms may last for a few minutes and then subside, only to return again. Symptoms that come and go should be taken seriously as clues that you may be having a heart attack. Many heart attack survivors describe chest discomfort as “pressure,” rather than “pain.” Don’t be thrown off if you don’t feel a sudden, sharp pain in the middle of your chest. It may feel as though something is squeezing your heart or that something is pressing on your chest. Understand, too, that major or mild heart attack symptoms vary from person to person. So if the pain or pressure you’re feeling in your chest seems minor, don’t dismiss it as unimportant. People who have a greater tolerance for pain tend to ignore heart attack signs that feel tolerable. Don’t try to tough it out or worry that you’re inconveniencing people around you by revealing your symptoms. You should also keep in mind that if you have already had one heart attack, the signs of a second event may be much different. One other common heart attack symptom is anxiety, or a vague but undeniable feeling that something’s wrong. Research shows that a heart attack causes victims to feel like they’re having a panic attack. But this is a dangerous assumption. Rather than get help immediately, some individuals having a heart attack want to chalk up their symptoms to indigestion or anxiety or feeling worn out from too much exertion. In addition, if the pressure in your chest isn’t too uncomfortable and you’re just a little short of breath, you may think you’re having some mild heart attack symptoms. This could lead you to not take them seriously. It’s true that some people have what are sometimes referred to as “silent heart attacks.” These result from temporary blockages in the coronary arteries. Sometimes they don’t even produce mild heart attack symptoms. Evidence of a silent heart attack may only appear much later when your doctor is examining your heart for other reasons. But you can’t count on a heart attack to be temporary or to cause only minimal damage. So treat major or minor heart attack symptoms as an emergency. 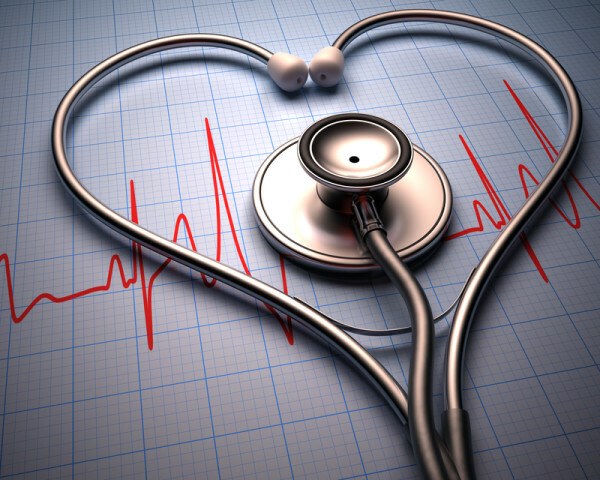 The faster you seek medical help for a heart attack, the less damage your heart will suffer. A disruption of blood flow to the heart is a problem, and there will be consequences. If you have risk factors for a heart attack, including high LDL cholesterol, high blood pressure, smoking, obesity, diabetes, or a family history of heart disease, and you start to feel heart attack symptoms of any kind, call 911. Don’t try to drive yourself to a hospital. Your symptoms may become overwhelming, placing yourself and other motorists at risk on the road. Make sure your loved ones know the symptoms of a heart attack and what to do if you or someone in your home starts to experience one. Sometimes fast treatment is what makes the difference between a heart attack being mild or major. a heart attack, angina, angina pain, anxiety, artery disease, atherosclerosis, back pain, blood clot, blood pressure, bone, cardiology, chest discomfort, chest pain, cholesterol, cholesterol high, coronary, coronary arteries, coronary artery disease, diabetes, for high blood pressure, hardening of the arteries, having a heart attack, heart attack, heart attack causes, heart attack signs, heart attack symptoms, heart attack symptoms in men, heart attack symptoms in women, heart attacks, heart disease, heart muscle, heart trouble, high blood pressure, high ldl, high ldl cholesterol, history of heart disease, hypertension, hypertension guidelines, indigestion, jaw pain, ldl, ldl cholesterol, mild heart attack, mild heart attack symptoms, muscle, neck pain, new hypertension guidelines, nitrates, obesity, obesity diabetes, pain, panic attack, plaque buildup, report, shortness of breath, silent heart attack, smoking, stroke, symptoms of a heart attack, tightness in chest, tired, what is a mild heart attack. with a mild heart attack, do all the symptoms normally present or can there be an absence of many of the symptoms yet still be a heart attack and not some other heart related cause? NAN DO PROLONGED HICCUPS INDICATE A HEART ATTACK? Heart attack, stroke, major blockage symptoms( not diagnosed ) Panic Attack all Feel similar…Emergency Room Care gives minimal help/Relief…..major problem in getting proper diagnosis! What if you have had all the symptoms at once all the time and test shows nothing????? I went to hospital and been diagnosed of mild cardiothoracic ratio of 0.54. what does it mean? I have all those symptoms almost daily. Went to WE many times, was told by a Dr not to come back, quit worrying and just take something for the pain because I had a clean Cath a year ago. I have a hostel hernia, GERD, and TMJ, all of which have these symptoms. It is still frightening though when your chest has so much pressure it’s hard to breathe. Hello Can you address costochondritis? Similar symptoms as a heart attack especially if you have it on the left side…….your thoughts? Any recommendations in strengthening that area? Thanks. excellent. I have had 6 bypasses. Hello, I’m Mario in May 2017 I had a triple bypass but I still experience swelling of my ankles especially when I’m driving. I would like to thank you for sharing this amazing content with us. The most important point in the content is ‘What Is a Silent Heart Attack’. This point really had some unique information that cleared my doubts. Also, I found a product called standing desk that would help to lower the risk of heart disease. I thought you might be interested in this article on https://universityhealthnews.com: Mild Heart Attack Symptoms: What Do They Mean?